Here is my first project of 2013. Pants. Told ya! To boot, I made these pants to go specifically with this top. I love this color combo (maroon and coral) and ever since purchasing the coral wool from Wool House at the American Sewing Expo last September (I totally understand if. you're. jealous! ), I've been scheming as to what the wool would eventually be. When a lady I work with gave me this little maroon wool sweater, it cinched the deal. 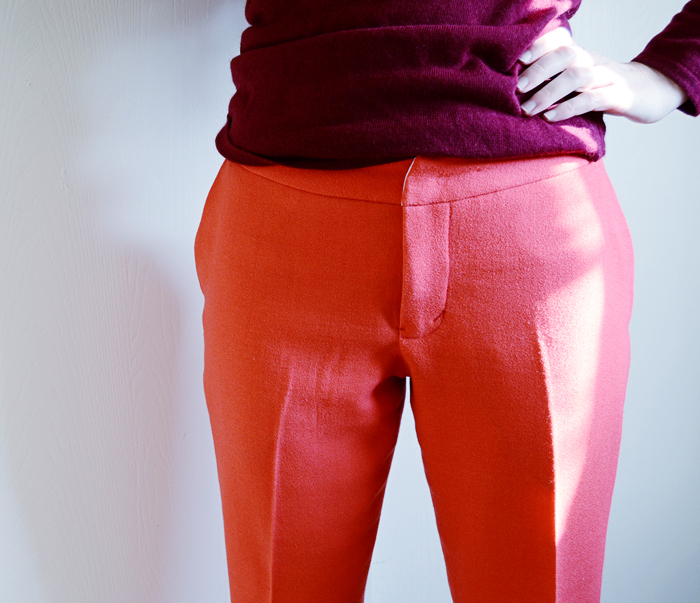 Coral wool pants. You can call me crazy, but seriously what beats these babies? I'm pretty ashamed that I haven't sewn more pants. Seriously, pants are truly something that I love wearing and am always thinking that I need to make and yet, I never do. So I feel that I've started this year off on the right foot with my first pair of pants in a quite some time (like since my pj pants from last year, ha). What's that? You want details? Of course you do! This is BurdaStyle 7447 (out of print) which is an envelope pattern. And don't get me started on how I'm completely confused as to the fact that there are BurdaStyle downloadable patterns without seam allowances and BurdaStyle magazine patterns without seam allowances and yet the envelope patterns have seam allowances but seem to be owned by Simplicity....? Whatevs. This pattern is impeccably drafted and I think would work for a variety of different shapes. They are a basic trouser and I made very few alterations to them. I added a little length to the crotch depth and took them in a smidge from the waist to the knee, but otherwise, these didn't require very much tweaking. I'm seriously impressed with the fit myself as usually I have a pretty hard time with Butterick/McCalls/Vogue/Simplicity pants patterns. The back looks fabulous as does the front and side and I'm terribly terribly happy with this pattern. There's a couple more tweaks I plan to make to the pattern for the next time around, which is going to be quite soon as I already have the next pair cut and ready to sew but otherwise, I'm a pretty happy camper. These pants are fully lined, which is harder than you might think with a fly front. Going to work on perfecting that for my next go around and I made the mistake of not putting in a better pocket lining fabric (like pocketing) for the pocket lining and engineering a better pocket in general. So the pocket lining inevitably peeks out a bit and since I used a lighter colored lining than the fabric, well, its doesn't look as professional as it could. No matter. They will still get worn and worn to death! I used Stitches&Seams absolutely AWESOME fly zipper insertion tutorial. Seriously friends, you can't improve on this rather foolproof way of putting in a fly zip. The tutorial is very clear and concise and hands down one of the easiest zipper insertions in a fly, I've ever done. I mean, doesn't my fly look pretty professional? Very flat and doesn't pull or distort weird in any place. I chopped the length off because I wanted a more cropped style pant and I omitted the carriers this time around, but will probably opt for them next time. The welt pockets in the back need to come down about an inch but otherwise, I've got myself a pretty good trouser pattern. Its definitely going to be a year of pants people! I've decided that I'm moving onto the Sewaholic's Thurlow pattern next and after that, I'm going to revisit my Clover pattern. Are y'all ready for a pants journey with me? And for what's its worth, cause it might be worth alot, this is what the pants look like after I wore them for a day too. The lining really helps the pants to resist wrinkling (and wrinkling isn't necessarily a bad thing, but you know). They are incredibly comfortable too, which is exactly why I have to have another pair, poste haste. Love your pants. The fit is perfect. I use this fly tutorial all the time. It is THE BEST. You have inspiried me to make some pants. I said I would finally make myself pants this year. I better get to it. Really nice, love the colors! I'm with you on the pant wagon. I just finished my first pair of Thurlow and I love them. Now I want more in different colors! But I feel, I also need to work on blouses this year. I start sewing last spring, and I have done like 5 Renfrew tops, and some other t-shirts, but I would like to have more classy tops. I really llike the button up with large polka-dot you put on pinterest. Those pants are awesome - they really suit you! Thanks for sharing the fly zipper tutorial. I'm going to give it a try and see how it compares to the one I normally use from Connie Amaden-Crawford's "A Guide to Fashion Sewing". OMG!!!! These pants are FABULOUS!!!! They look so custom made! You blew my mind! This pattern is on my list for 2013 once I have given birth and shed the baby weight! I LOVE those pants. They look awesome. And the color combo is so fun and modern. Maybe I need to sew some pants this year. Bravo! They're Fab! And the color combination is genius. Count me in for the pants journey--I've got 3 pairs on my list for SWAP 2013, and I chew my fingernails every time I think about attempting them. My first pair of Clovers were wadders. I'm looking forward to seeing how yours come together--Clovers and otherwise! Holy cow! They're awesome. And the fit in the derriere is perfect! Love the colors!!! And the pants are fabulous. I really like the cropped length and the relaxed fit. I need to make myself some more pants. The pants look fabulous, and I love that they're in such a bright color. Winter is blah enough without everyone going around in blah dark and neutral colors all the time! I don't suppose pocketing is something you'd consider adding to the shop? :) I always have to resort to using whatever cotton I can find, because of course Joann's doesn't carry anything like that. 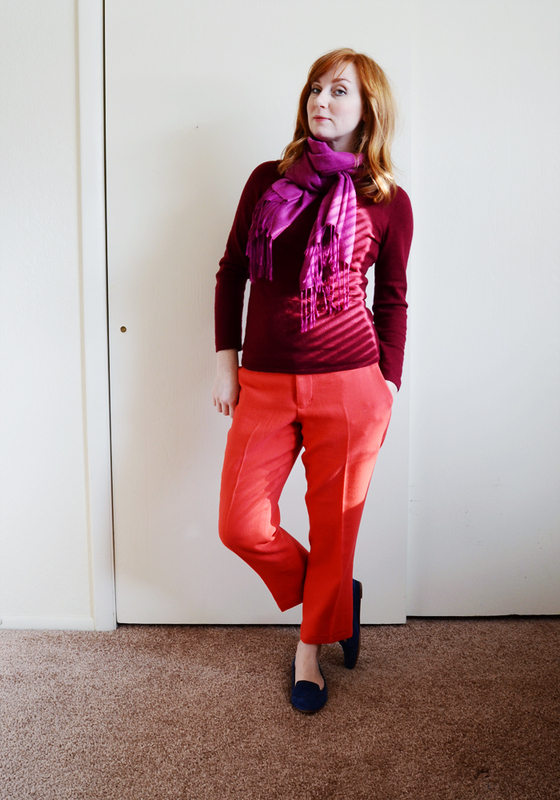 i adore bright colored pants! these are fab and i totally plan on making pants and just separates in general this year also. can't wait to see more of yours. This outfit is simply to die for. Period. The pants are gorgeous, some things are so perfect that there are no more things to say. WOW!!! These are divine!!! Seriously, awesome job and love the color combo of this whole outfit!!! These are gorgeous! I love the colour, I would never have thought to put coral with a maroon sweater, but it could be my new favourite colour combination. I'm going to check out the pattern you used. Sewing trousers is one of my goals for this year, and this style is exactly what I'm looking for. Wow...your pants are pretty darn awesome! 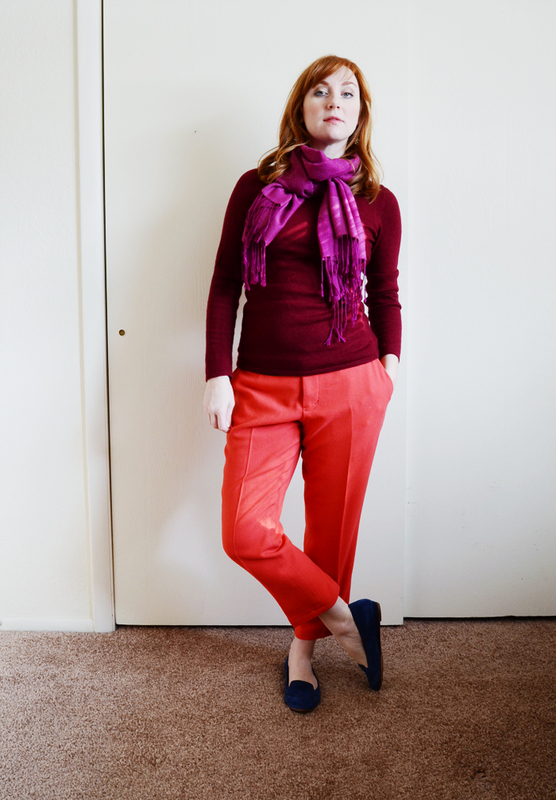 So far Burda patterns have given me the best results in my pants making experiences. Your trousers are amazing and such perfect welt pockets. These are crazy amazing! I adore coral and it looks fab with your colouring. I am so not ready for trousers yet but these are the kind of trousers I would be making if I was. Fit looks spot on. I just love your pants. The fit is impeccable. Well done and what a great start to the new year. Happy new year! Great pants! What color! And all the details! I'm excited for your year of pants, and I'm looking forward to your take on the Thurlows, one of the patterns I want to make next. Happy sewing! I like those a lot! 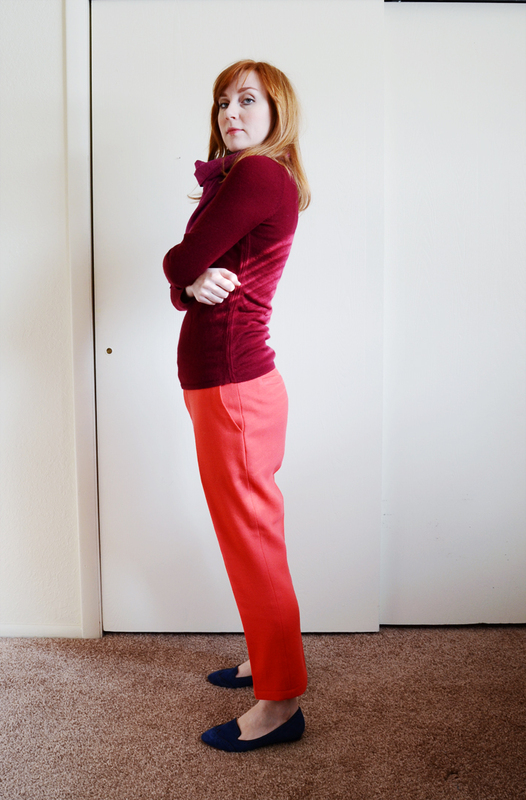 I am almost done with a pair of red wool cropped pants, very similar to yours, so thanks for motivating me to hem them and wear them out! @Marie F. - I'm with you too! I definitely need more tops, its a crying shame that I don't have more tops. @Belinda - I've used several different fly zipper insertion methods and this one is hands down the easiest and the best! Seriously Debbie is a genius! @Julie C. - Definitely try these pants out - they are a sure winner. Also Congrats on your new baby! Yay! @Kelli - Yes you do! Sew some pants now! @Lauren - I completely agree. These are very similar to the Thurlows and actually I was thinking that maybe I shouldn't make the Thurlows next, but I'm very curious to see how they fit differently. If nothing else, I'm ready to just sew for the experience of sewing and seeing how things compare, you know. @K-Line - Why thank you! I'm very happy with the fit in the derriere! @Becky - Winter is blah. I couldn't agree more about needing bright colors to cheer me up. Also on the pocketing, I'll investigate. Its actually something that would be really nice though I will admit that I do love using printed cotton voile as it gives everything a nice touch of color and fun. @New Ribena - I've heard that Burda pants are, in general, just a better fit all around. I have some serious pant fitting issues when I use the Big 4 and these were really not hard to fit at all. @Miranda - Ohhhh! I'll see what I can come up with. @milena - go hem your pants now! My next pair of these is bright red, so we'll be twinners! Yay! I love the pants, the color is amazing! Wow, Sunni, those are PERFECT pants! The fit is flawless and the color is so pretty! I am so impressed. They fit you so well. I am still working on achieving a good fitting pair of pants. Did you have to do any type of fisheye dart under the rear? It seems that I am going to have to do that to eliminate too much fabric. what a win to open the season with! 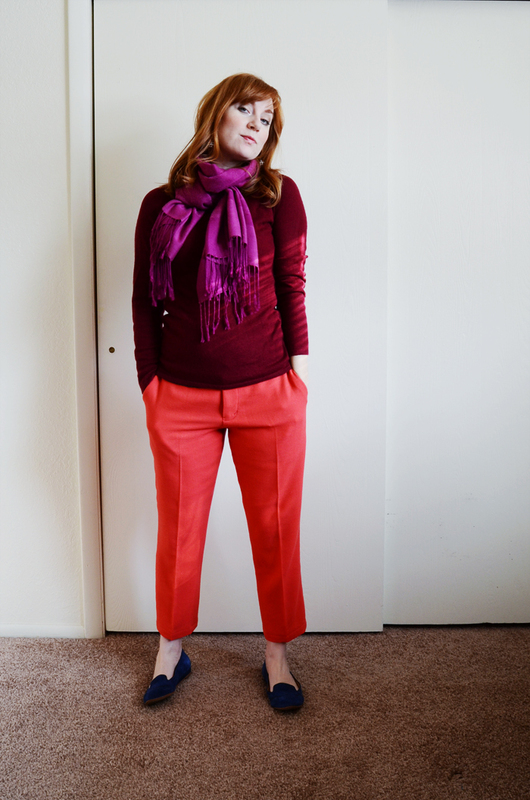 I recently made my first pair of pants (other than PJ pants), thurlows, and I am SO Happy with them -- good luck on yours! I recently used my first Burda envelope pattern and was also wondering about the whole seam allowance thing. Wow, gorgeous pants! I'm definitely bookmarking this post to reference the day I decide to tackle pants. Beautiful job. Amazing fit and I LOVE how you've mixed red based colours together. Inspirational styling! Your pants are a home run for 2013. Liking the color sensibility and ooooohhhh that fit! I love your pants! The color is fantastic and it looks even better with the sweater. I made this pants once (my very first pair of pants) and I love the fit! The only change I did was to make a straight leg. Great, great pants! Until today, I wouldn't have thought I would love that color combo, but after seeing it here, I really do! And imagine my surprise to read that you used the zip tutorial on my blog. I'm glad you liked it. Those are super cute. Rest assured as soon as I finish the jacket I'm working on (it is taking forever), I'm going to work on the pants with the pattern you taught me to draft. These look amazing!! I love the fit and the color really sets them apart. I've already dug into my old Burda Mags and found a similar pattern to try out. Thanks for the inspiration! Sunni, fantastic job and the color combo is to die for! Great job! They are fantastic trousers and I'm so very jealous that you managed to get your hands on that fabulous piece of fabric. I'm lucky if I can find woolen fabric, let alone in such a gorgeous colour. I'm totally jealous. These are absolutely gorgeous, and my favorite color! Awesome work! 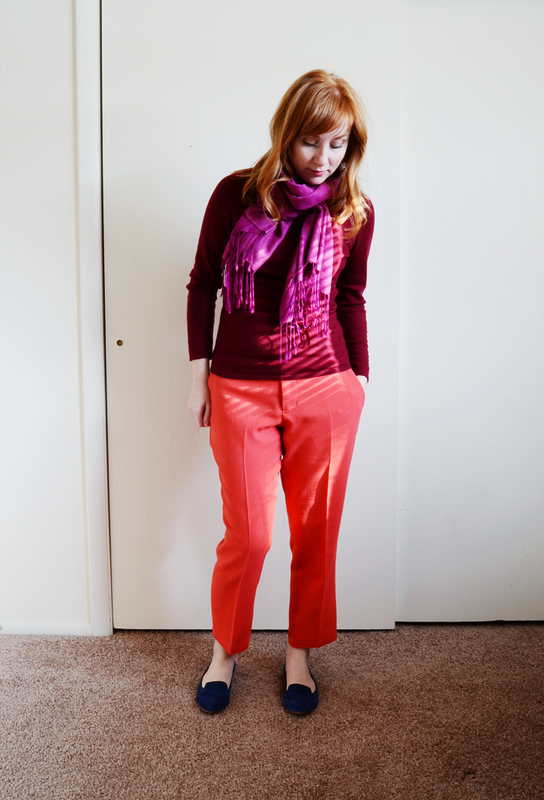 Nothing can beat coral cropped trousers! Bright colors is just such a mood lifter! BTW, I plan to make a yellow pair of pants for this season, hope they will provoque no accidents on the streets. Thanks for sharing the fly zipper insertion tutorial! They are just gorgeous PLUS I love your eye for colour. I would never have thought of combining those three colours and yet it totally works. Fine sewing and fine style! Um, I loooooove these! They're the perfect style, fit, and color! Great job, dood! I really want to make my first pair of pants this year (and hopefully a few more) since I live in pants, but they scare me a little (crotch depth WHAT?)! Sunni, you look great in these! I love the Burda pant patterns for their crotch shape, and you'll probably find that if you copy the curve from this pattern onto every other pant you make, you'll get a good result. And about the seam allowance on the Burda's in the envelopes - when the patterns started being offered mainstream about 6 (10??) years ago and were then taken over by one of the big 4, there was a lot of resistance to there being no seam allowances - people just weren't used to having to add them, and kept cutting our unsewable garments because they forgot. They made a big deal out of it when they started offering patterns "now with seam allowance!" I myself would rather they didn't - it's so much easier to add exactly what I want for allowance onto different parts of the pattern. These are fabulous! I love the color. And they make your bum look great- I'm going to have to check this pattern out for myself! Awesome, awesome, awesome pants! I have this pattern and it looks like a great one, especially after seeing your amazing version. I am sort of the color master in my circle of family and friends, but you always rock my world! Coral with maroon, fuschia, and cobalt!!! I never would have thought to go there. The pants look awesome! I love the color. I rarely make pants or shorts. I mostly stick to skirts and dresses. Making pants could be a good new year's resolution though! these pants are gorgeous! I love the color and the shape and I'm totally jealous!. I,ve had pants on my list of things to make forerever, but I can't seem to get around to making them...you're inspiring me to try a little harder ! Totally amazing!! Such a beautiful color and classic cut. I'm sure they will get worn a ton - I also LOVE pants and plan on making more trousers this year - may have to give this pattern a try! I recently made my first pair of pants. I decided to make some jeans because I had the material. The original pattern was from a Burda magazine, but it would have been better as slacks. I want to tweak it and make some more pants though. Wow I am so impressed with these! Your tailoring skills are really magnificent! I have yet to tackle pants. Cheers to you! Love these pants Sunni. They are sooo cool - both the style and the color. Thanks for the link to the fly front tutorial! I love everything about these pants. Absolutely drooling over the color, and the fit is perfect. Thanks as always for the inspiration.